Regular readers of BMA, and I know there are dozens of you out there, know that there is nothing I like more than science. Particularly science extrapolated from a single experimental result and recounted in blogs. For example, just last week the NYT’s Economix blog asked Do Hungry People Take Bigger Financial Risks? According to some scientists in the UK, hungry people, or at least 19 guys in their mid-20’s who hadn’t eaten lately, tend to take more risks. What’s more, the blog post describes an experiment different than the one in the paper that it links to, which tells me that there must be two scientific studies out there supporting this exciting new finding. It is exciting because it confirms a previously held belief of mine, that the problem we have in this country is too much food and not enough risk taking. In the Good Old Days we were a nation of bold and self-reliant adventurers. And we were skinny. There were no “big and tall” guys in Philadelphia on July 4, 1776. Cornelius Vanderbilt, John D. Rockefeller, Howard Hughes, Bill Gates? All thin as a rail. And we didn’t put a fat man on the moon, we put the finest examples of scrawny risk-taking American manhood there. But somewhere along the line, we went soft. Pillsbury Doughboy soft. 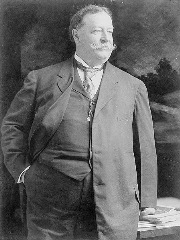 I think it started way back with the corpulent President Taft, pictured above, responsible for, among other things, the spirit crushing federal income tax. I realize that not everybody sees this as I do. Somewhere there is a larger American reading this post while popping open another can of Pringles and asking “Hey, Frank, wasn’t the Great Recession caused by too much risk taking, rather than too little?” Not so, fatso. Sure, there were a few lithe and manly men bravely taking on great piles of risk just for the thrill of it. (I don’t know this for a fact, but I am pretty sure that the entire staff of AIG’s Financial Products Group ate sensibly and hit the gym a minimum of four times a week.) But those are not the ones who got us into the mess we are in today. It was the risk-averse girly men (and women) who sat around eating bonbons and dreaming up ways to get others to take on what ought to have been their own risk that blew it all up. In the old days, if one fella loaned another fella money on his house, the first fella took it on the chin if the second one defaulted, just the way God and Adam Smith intended. Not today. If a borrower defaults our “fat cat” bankers don’t care, because they have long since sold the loan to another chubby finance type who combined it with a hundred other mortgages and sliced it up into low-risk bonds suitable for the huskiest of investors. It is often said that America is facing a crisis of obesity. What often goes unmentioned are the economic effects of this national wave of personal enlargement. It is not just that it is the leading driver of rising health care costs. It is sapping the entrepreneurial spirit that once made America great. Consider, if you will, our bank branches. A hundred years ago they were free standing structures built of great blocks of stone with narrow doors and windows and bars separating the tellers from the customers. The symbolic message of that architecture was clear: no fatties. Today, not only are the iron bars long gone, but banks are now commonly located inside supermarkets. Other social trends have been accelerating this race to extra large risk aversion. Cigarette smoking is on a long-term secular decline. And while our government continues to fight the use of cocaine and crystal meth, marijuana use is becoming more respectable and has a fighting chance of becoming completely legal in our largest state this fall. And then there is the dangerous trend of stunt food at our nation’s restaurants. Unfortunately, it is pretty clear that when the Obama administration gets around to addressing this problem they will advocate their typically unworkable and unpopular big government solutions. They will propose warning labels on all food, penalties for employers that maintain cafeterias, and, of course, the widely opposed gym mandate. And I consider impractical the so-called “diet-and-trade” schemes advocated by moderates, in which currently large citizens will be given calorie credits which they can either use themselves or sell to others. No, the only thing that makes sense is a simple, direct, calorie tax. Historically, this has been resisted by lobbyists for food producers and consumers on the grounds that food is a so-called “necessity.” But we already tax such things as gasoline and cell phone service, so that argument does not really hold water. When you get down to it, the problem we have in America today is the widespread availability of cheap eats. The stunt food I linked to above, a 1500 calorie burger with two grilled cheese sandwiches in place of a bun, is currently being sold for only $5. What’s more, under current law, it can be sold to anybody, including minors, as often as they like, and without a waiting period of any kind. The simple fact is that the price of food in this country has failed to keep pace with inflation and our rising standard of living. In 1950 Americans spent over 20% of their disposable income on food. Today, that figure is only 9.5%, even though the average American now consumes 24.5% more calories per day than they did in 1970. If we are to return to the svelte prosperity of the past, we need to eat less. We need a federal excise tax on food. I suggest 75 cents per 100 calories, which works out to be an average of $30 per person per day and which will eliminate the need for all other federal taxes. Only when the 41 oz. Slurpee costs $8 with tax will we think twice. And only then will we embody our true American character, risk-taking and a bit peckish. 2000 is what is recommended by the government, doctors, sane people, etc. 3900 is what is estimated by the Department of Agriculture as actual consumption, although that includes waste. (Which would get taxed too.) I did round up a little. If the goal is reduce caloric consumption, wouldn’t there have be some mechanism to raise a consistent amount of revenue despite the decline. Basically, if the tax has its intended effect, it would have to double shortly after introduction to continue to earn sufficient revenue. Also, I can never tell when you’re serious and when your toungue is firmly in your cheek. I’ve heard that most of the reported wastage is from restaurants and grocery stores. How would you force the taxpayer to pay for those? Also, regarding the grilled-cheese-bunned-burger. A standard big mac, fries, and drink has 1200 calories. The grilled cheese monstrosity is only 25% more. Frank, isn’t the cost of most food in this country subsidized? And isn’t that a relic of the Depression that’s only subsidizing large agribusinesses? The joke is good and all… but as “tm” mentioned – the US government drives down the price of certain foods (ex. corn) artificially through subsidies. Ever wonder why high-fructose-CORN-syrup is in everything? Because your tax dollars are paying to subsidize it. The question of government’s role in the economics of food is real. Frank Curmudgeon = Mark Twain. Brilliant. Also how are we gonna fly to all our business meetings if we’re too fat to fit into the seats…..
lol… I’m surprised they didn’t re-hash the worn out rumor that high taxes reduce teen smoking, and thus should also reduce teen fatties. Grabbing some numbers from the ol’ reliable internet, we get a subsidy number of about 17 billion USD per year (for 1995-2009, according to http://farm.ewg.org/region.php?fips=00000 which of course has an agenda which opposes farm subsidies). In comparison, one of Frank’s favorite government bailout projects, the USPS, will lose at least $6 billion this year. I’m sure our svelte members of Congress will get right on cutting the farm subsidy so they can tell us how much taxpayer money we’ll save. But wait, how would we balance our new found peckishness with the well documented (heh?) finding that we buy more food when hungry?